Spring is almost in full effect, which is something that we are all very glad about! Spring means backyard celebrations and rooftop parties! It also means that some of the prettiest flowers will be blooming. Another great aspect of spring is that it will be easy to incorporate Pantone's colors of the year, Rose Quartz and Serenity. In March, we have found that there are specific flowers that are on their "A-game" so read below about our Top 5 choices for this season. These beauties are in full bloom, as we speak. These flowers are known for being pretty tough and are known to stand against heat and cold. There are 12 different species of the daffodil, but the Trumpet Daffodil (as seen above) is our favorite. Daffodils are known to have several meanings including "regard" and "chivalry". This flower is indicative of rebirth, new beginnings, and eternal life. It also symbolizes unrequited love. A single daffodil foretells a misfortune while a bunch of daffodils indicate "joy and happiness" according to the Flower Expert. These soapy-scented flowers come in a variety of colors and bi-colors. They are symbolic of innocence and have 14 species according to the Flower Expert. Freesia flowers face upward and typically grow 8 funnel-shaped bundle per stalk. Another known fact is that Freesia is typically included in many bath soaps, fragrances, and scented oils. This pretty flower is also known as the "buttercup" and have 600 variations in this enormous species. Ranunculus is typically seen as "multiple layers of delicate, crepe paper--thin petals, looking like an origami masterwork" as Gardening.com described the flower. They typically emerge in March and last for about six weeks. Lastly, Ranunculus is known to symbolize radiant charm. "Tulips are some of the most popular spring flowers of all time, and the third most popular flowers world-wide next only to the Rose and Chrysanthemum," stated The Flower Expert. These facts might be surprising to you, but it gets better because they are also known to symbolize: imagination, dreaminess, a perfect lover, and a declaration of love. Bouquet - created by Petals by the Shore. Photo - by Rachael Foster Photography. We had to sneak these in since they are starting to become increasingly popular amongst brides. The non-floral bouquet could be made of paper (as you can see below), or the bride could choose from other materials. For example, a bride that is an avid reader or paper enthusiast might like this one. 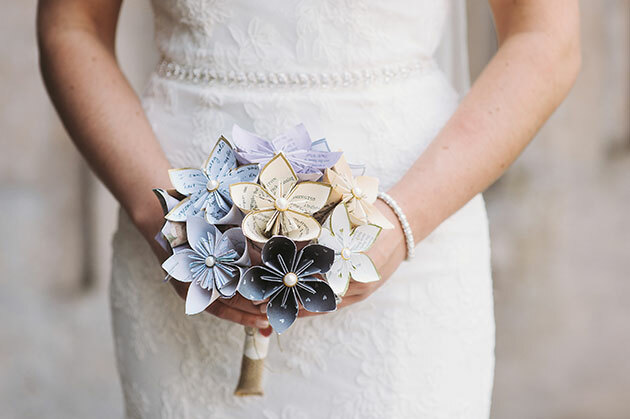 Maybe she really likes to travel and chooses to make her bouquet out of atlases - as a bride we know did. There are also alternative bouquets that have been made out of materials such as feathers, or the glamorous bride might choose a stone brooch bouquet. The options for your non-floral bouquet are limitless! ← Should I Hire a Planner? : Top 10 Reasons Why You Must!